today i planted the four remaining pea sprouts (one had succumbed to some sort of wilt or fungus). no space left in the raised bed, so these sprouts are in the bed along the east fence in the backyard. i got creative with some stakes and made a four-sided teepee for the future pea vines to climb. and i solved the problem of how to secure the sprouts so they don't flop over before they have a chance to wind around the supports -- tie them up (carefully) with strips of shredded paper. i use a shredder for old bills and such that i don't want to put in the trash and then mix the shreds in my compost piles (also good to add a handful to the bottom of the kitchen scrap container -- keeps the daily coffee grounds from becoming a dense mass that must be scooped out). i actually came up with the paper tie idea shortly after planting out the first six peas and it has worked very well. speaking of peas, the survivor pea has three pods and continues to bloom. Happy 1st Blog-Day! garden spot is one year old today. here's when it all started. 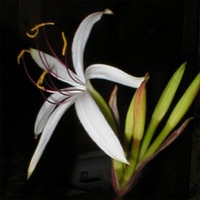 Crinum Bloom. lo and behold, the cut crinum has bloomed. so, now i know that they can bloom after cutting, even if bloom time is three days away. as you can see, there are five small flower buds, only one of which has bloomed so far. this scape came from one of the in-the-way-crinums that i dug up from the area around the side door and relocated behind the garage early last year. the older, undisturbed crinums have much larger blooms with many more per scape. i've managed to preserve my three remaining pentas by covering them with cardboard boxes the last few nights. we were supposed to have overnight temperatures in the low 20s earlier this week (i think it actually only got as cold as upper 20s), so i went ahead and cut the flower scape from the crinum. it's now in the kitchen windowsill and continues to progress -- it may go ahead and bloom after all. or maybe not; it's still several days from opening. i also put extra mulch in the raised veggie/herb bed and everything there still looks good. even the baby peas. four of the five erlicheer narcissus have flower buds (one of them has two buds). Seedlings Everywhere. i've been trying to combat the cold weather by separating flower seedlings and putting them in pots. in addition to the five peas i still have inside, i now also have an obscene number of shasta daisy seedlings, a bunch of forget-me-nots, and a smattering of bee balm. oh yeah, and some miscellaneous herbs. i'm running out of warm, suitably lit, cat-proof places to put all my seedling trays. the breakfast table and the desk in the sunroom would be perfect, but that is dedicated cat-lounging space. i'd have to close the doors to the sunroom to keep the cats out and they'd be mighty upset about that. there is a plant stand in there, but the two out-of-(easy)-cat-reach platforms are already occupied by potted gardenia cuttings and i can only balance one seedling tray on the very top. the five peas, a couple of pots of daisy seedlings and my two columbines (i thought they were too cold outside) are occupying that enviable spot. a smallish tray with a pot of four tulip bulbs, half a dozen pots of miscellaneous herbs and half a dozen miscellaneous flowers are on top of the stove (except when we're cooking) and the big tray with the remainder of the flower seedlings (36 tiny pots of four seedlings each) is on top of the fridge. so far i have resisted creating an actual seedling laboratory -- i.e. dedicated shelves with growing lights -- but i see that in the future. maybe not this spring, but definitely at some point. i overlooked the lantana and crinums when i did the damage report on sunday. the lantana got a bit crispy around the edges and some of the crinum foliage is decidedly mushy, but i expect all to recover. i'm a little sad about the crinums since one of the back-of-garage plants had just put out a flower scape a few days before the temperature drop. it hadn't developed enough for me to cut it and let it open inside and although it hasn't turned to mush, i'm not sure whether it will be able to bloom. speaking of plants and cold weather, donald burger has freeze data for houston plants on his gardening site, which, if i'd thought to review earlier, might have prompted me to protect the pentas. Planting Peas. yesterday afternoon i planted six of the pea sprouts outside. they have gotten too tall to stay upright without support, so it was time for them to move out. three went around a small tomato cage rescued from a neighbor on trash day; three went around a teepee made of stakes. as of this morning, all were still alive. however, we have another cold front coming through tonight. i'm more worried about wind than temperature since they haven't yet had a chance to wind their tendrils around the supports. i'll have to try to gently secure them somehow. arrgh. i was overly confident. most of the pentas (pentas lanceolata) have perished in the cold. to be honest, it didn't even occur to me that i should try to protect them even though i knew in the back of my brain that they are "tender" perennials. hopefully, some of them will come back from the roots. i've been so happy with these plants that i'll definitely buy more in a few months, regardless of the recovery rate. as it turns out, the ixora are hardier than the pentas. to look at them, you'd never know there was frost on the ground this morning. how cold was it? i'm not sure, but it's about 32F now, so i would guess the overnight low was in the upper 20s. that's pretty nippy by houston standards. i don't worry about bulbs, shrubs, trees. it would have to get much colder for them to suffer. i took the picture below earlier this morning. note that the very dead penta is flanked by two still-living pentas, one of which is actually blooming. Sugar Snap Sprouts. the peas are progressing very well. they're now between six and eight inches tall. i'll probably plant them outside within the next week (weather permitting). burpee has vital statistics for the sugar snaps. the lone surviving pea vine is still hanging on and has a couple of pea pods developing.